California's Yosemite Valley has always been a land of magnificent waterfalls, mountain peaks, towering sequoias. The 19th and 20th centuries brought to it promoters and hoteliers with talents to match the scenery. J.M. Hutchings was both promoter and hotel operator. In 1855, he formed the first tourist expedition to enter the Valley. He began publication of Hutchings' California Magazine the following year. J.M. Hutchings was both promoter and hotel operator. In 1855, he formed the first tourist expedition to enter the Valley. He began publication of Hutchings' California Magazine the following year. 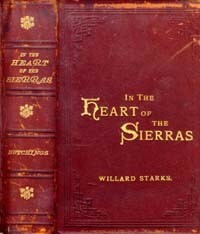 In 1886 Hutchings published this book, describing himself on the title page as J.M. Hutchings of Yo Semite. This second edition came in 1888 with a preface in which Hutchings explained that "the designs for the embossed cover is, in black and gold, are by Mr. Thomas Hill, the eminent and well-known artist'. It included a large fold-out "official map of the Valley and its surroundings" of which Hutchings boasted in his preface. Hutchings was not above porting the tourist joys of what was to become a great national park in 1906. He quotes admirers of the Valley, famous and obscure, on its wonders. IX. Its First Winter Vistors.